Distilled water is needed in hospitals for running autoclaves and in the workshop for the maintenance of lead-acid batteries for cars and electrical backup systems. Normal tap water must not be used for technical applications because it contains minerals. Minerals are important for the human body, but harmful for any technical application. Technical water has to be free of minerals and other solids. Unfortunately the quality of distilled water is very different. Specially in the hospitals of developing countries usually simple tap water is used instead of distilled water and the bottles of distilled water you can buy in the streets is far behind European or US standards. Often these 'distilled waters' are also just normal tap water. This causes a lot of problems. Car batteries will be destroyed soon after refilling and operating theatre personnel complain about the damaged surfaces of their expensive surgical instruments. To prevent these problems it is important to make sure that only distilled water of good quality is used. It is the task of the hospital technician to check the water quality frequently. The easiest way to do so is the measurement of the conductance of the distilled water. The conductance is nothing else but the reciprocal of the resistance. The unit is G and it is measured in S/m (Siemens per meter) or µS/cm. In electrical engineering the conductance is used to express the property of a material. But also the conductance of liquids like water can be measured. Then the conductance is measured when the electrodes have a surface of 1 cm² and are placed in a distance of 1 cm to each other. The conductivity of water is not fixed. It depends on the dissolved solids specially on minerals. Distilled water is almost pure and has a very low conductance. The purer the water, the lower the conductance (or the higher the resistance). Distilling means boiling water and condensing the steam. The result is free of dissolved solids. In practice the conductance is less than 10 µS/cm. The following table shows the different waters and their conductances. The lowest conductance has distilled water and the highest the salty sea water. For technical applications only distilled water must be taken. And even among distilled water there are differences. While a distilled water with 15 or even 30 µS/cm can be used for sterilizers it is not good enough for acid batteries. When the quality of distilled water too bad or just normal tap water is used the following problems will occur. The life expectancy of acid batteries drop significantly and batteries will be destroyed soon. 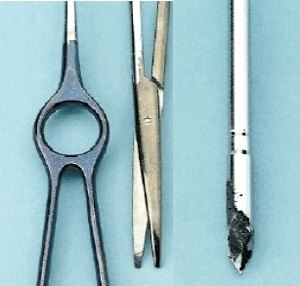 The surface of surgical instruments get effected and destroyed by chemical reactions. Deposits of lime effects the function of heating elements and temperature and level sensors. Modern sterilizers will not even start when the water quality is too bad. Nowadays they are equipped with an internal conductivity meter that checks the water quality automatically right after switching on. Therefore a regular check of the water conductance is essential. Damaged instruments, caused by poor water at the sterilization process. In principle the conductance of water can be measured with an (mega-) ohm meter. But to get comparable and reliable results the distance of the electrodes, the size and the material of the electrodes have influence of the measurement result. A special conductivity meter is the best choice. The instruments have a digital display and are easy to use. A conductivity meter is not more expensive than a digital multimeter. A digital conductance meter should be present in every hospital or at least in every hospital workshop. A regular measurement of the water quality should be part of the sterilizer maintenance. Specially for acid batteries use only the best quality of distilled water. 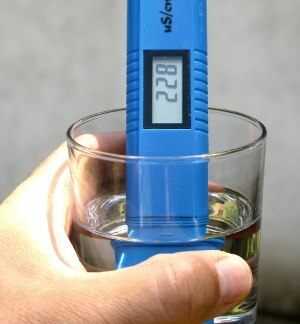 The water should have less than 10 µS. Before buying bigger amounts of distilled water check the quality first with the conductance meter. Do not trust the labels of the bottles. In Tanzania for example none of the distilled water you can buy are distilled water according the international standard. They are just normal tap water. If you can not buy distilled water in adequate quality distil it yourself. Boil water, condense the steam and collect it. That works fine for small amounts like for the maintenance of car batteries. The alternative to distilled water for running autoclaves is rain water. Rain water is already condensed and it is free of minerals. It is for free and the conductance is very good (15 µS in Tanzania). Before using the rain water for sterilizers the rain water has to be filtered. Rain water contains pollution from the air and dirt from the roof and the collecting tubes. A simple plastic mesh filter is enough. Expensive water purification filters are not needed. Never use ground or tap water for sterilizers!